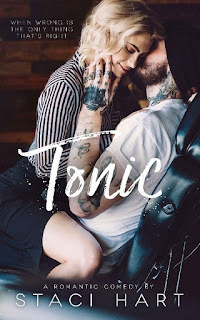 Tonic- a hotbed of tattooed yumminess. With both sexes represented for sampling, anyone and everyone will enjoy the viewing with pleasure. There's plenty of drama if you search, but this secure family holds its own in their little bubble of New York. Joel Anderson, oldest brother and owner, along side his brother Shep. Tragedy, love, and loss...parts of life- see where they fit into the Andersons' lives. Ok, so maybe I won't be an executive producer for the show. Perhaps Ms. Hart will let me be a measly PA. I can get coffee. Well now that we've crushed my dreams, I should probably explain my random weirdness. Yeah, never mind, I can't explain and you don't have that kind of time. Joel is against this from the get go. He DOES NOT want his life being manipulated, twisted, and aired for all the world. It seems he's in the minority and allows his brother and friends to sway him. He never could have prepared himself for her...Annika. The executive producer who seems to spark more than desire in the easy going, tattooed, bearded man. Everything about her has him on edge. She lives for her job and her family. That's it. She won't risk either, especially not on some hairy, f@cking beast. Nope, not her. Not at all. That's ridiculous! But we all know what saying NEVER is...it's a challenge. Will they live up to it or tear it apart? Can they be more with work getting in the way? I loved this book. True to Staci's brilliant writing, she had me crying. The feels, the intense longing ( sorry, had to pause to shiver) it gets you in the center of your being. It's a fun story. The back and forth push and pull is very entertaining. Hot hands moving everywhere, caressing skin, ready to...Mark it! What were you thinking, it's a book about a tattoo parlor- honestly, your dirty mind is distracting. Ok, well, not just your mind...some very naughty things happen in a very good way. But you would need to one click before you hear about any of that! This review of Tonic by Staci Hart is for The Sweet Spot Sisterhood Blog. Well, Staci has done it again! Tonic is definitely one-click worthy. I give it 5 Stars. I loved this book and found it very hard to put down. If you like hot, tattooed, bearded men then this one is for you. Hart knows how to write those swoon worthy steamy scenes too! Tonic is the story of Joel, a tattoo artist and Annika, a television producer. Joel and his brother, Shep, own a tattoo shop named Tonic. They were approached by reality tv show producers, Laney and Annika, about doing a show at Tonic. Joel was totally against it until he learns that his rival, Hal, is being considered now instead. So against his better judgement he agrees. As the show sets up for production, Joel must work closely with Annika. This is where it gets interesting because Joel and Annika seemed to have gotten off on the wrong foot and don't quite see eye to eye. Can the tattooed prince melt the heart of this Russian ice princess? This is my first Staci Hart book and it definitely won't be my last. I really enjoyed the story. I love a romance that has a bit of humour in it. The interactions between free-spirt tattoo artist, Joel, and uptight Annika, had me giggling out loud. Joel and his brother are approached to do a reality show in their shop and Annika is the tv producer on the show. Joel doesn't really want to do it but agrees (you need to read to find out why) and sparks fly between them. Can they work so closely together? Can two very different people make it work? ...and what is she hiding?